Configuration change management is the control of a product definition throughout the lifecycle of the product. It is an integral part of the design and development process for products and processes. Traditional change management (CM) follows an ‘engineering’ change process which controls to change deign definition and the alignment with “as-built” configurations (ensuring that physical items conform to the design). How everybody else in the organisation update their documents and data is often up to them or as per other processes. A change management process, although does not ensure design integrity, includes stages to review the change and actions that are taking place in the process. Accordingly, most organisations have many independent change processes, some of which are formal and many are informal; keeping everything in sync is a major challenge. 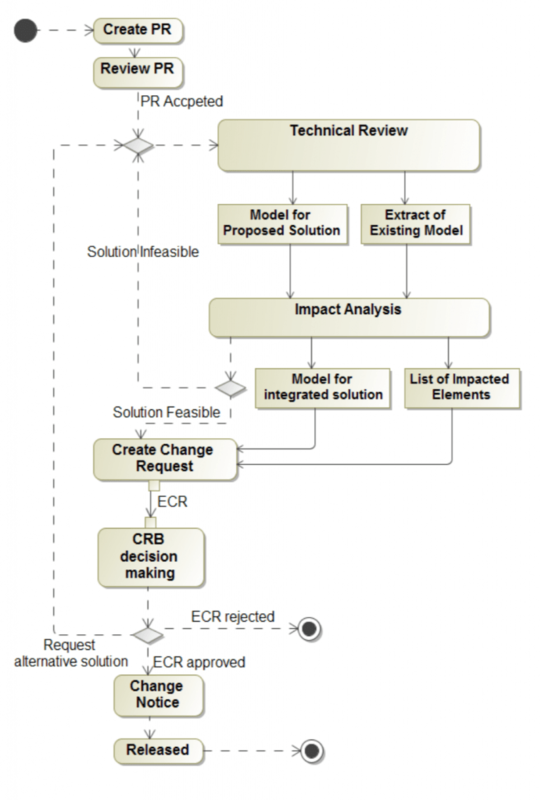 CMII-based processes go beyond CM, covering the overall change of a business and applying Model-Based Systems Engineering (MBSE) principles to enable better decision making and consistent impact analysis; see figure below from Lin et al. (2015) as a typical model-driven change management process. 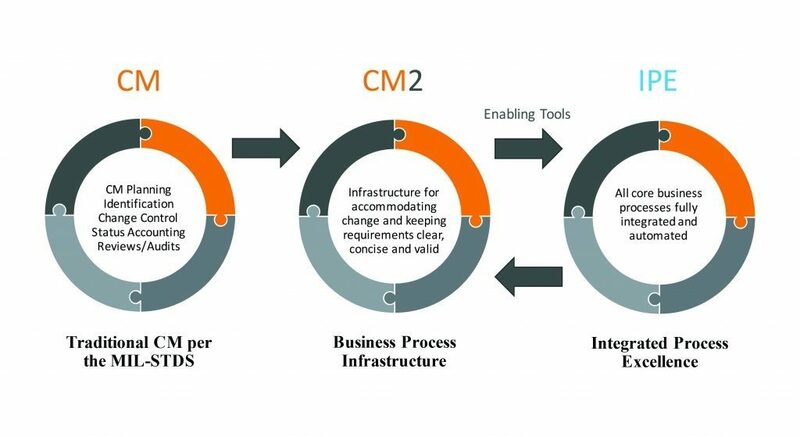 CMII is not only about the change process itself, but also how the problem report is created, how the change impact is assessed across the enterprise and against the relevant requirements, how the change decision is made, communicated to the various stakeholder and how the change is implemented across the enterprise. CMII is an enterprise wide approach to control change and configuration management, while promoting continuous improvement because the end-to-end lifecycle of the product is controlled. The CMII principles suggest consistent impact analysis of changes and solution feasibility assessment, aiming at enabling the development of effective formal deliverables which conform to their design requirements (similar to systems engineering and design for X loops). CMII brings all configuration management related activities under one umbrella and provides an infrastructure that can accommodate change, keep documented requirements clear, concise and valid while ensuring that configurations conform to their requirements in every case. Providing the framework to manage complex change, impacts, incremental baselines, and event effectivity includes governance, change board(s), enabling tools processes while maintaining event closed loop traceability. Such framework is a prerequisite for achieving integrated process excellence (IPE). Change traceability and documentation integration to the configuration process are enablers of data quality and process conformance. Additionally, automated PLM and ERP tools for configuration management are important to controlling cost and efficiency to the process. Challenges in implementing change management processes include workflow complexity, speed of execution, bureacratie, adherence issues, lack of flexibility, poor data traceability, integration inconsistencies, and scaling limitations. Standard changes that require a modification to the product requirements or design does not always follow the same process. There are times where a change request will require a fast track process. The overall process must be able to adapt to different change categories. Once achieved, consistent conformance and continuous improvement are byproducts. This post was originally published on LinkedIn on 21 April 2018.